Feb 1 (AZINS) Opposition parties met here and decided to approach the Election Commission on Monday for redressal of their concerns over the use of EVMs in the upcoming Lok Sabha polls.Congress president Rahul Gandhi, addressing the media after the meeting on Friday, said the issue of EVMs was discussed at length by the opposition leaders. "We have had a good meeting. All parties have agreed to discuss in detail three issues -- two central and one structural -- jobs, agriculture and attack on institutions. We are going to meet and find solutions to these problems," he said. "The election will be about jobs, agriculture, attack on institutions, and corruption by the prime minister in the Rafale deal," the Congress chief said. Asked about the budget being hailed as a "surgical strike", Gandhi said "surgical strike" will happen on the prime minister and his government on issues such as Rafale, jobs and demonetisation.He said opposition parties will meet election commission officials on Monday over concerns about EVM tampering.Apart from Gandhi, NCP chief Sharad Pawar, National Conference leader Omar Abdullah, Samajwadi Party's Ram Gopal Yadav, Bahujan Samaj Party's Satish Chandra Mishra, DMK's Kanimozhi, Derek O'Brien of Trinamool Congress, CPI's D Raja, CPI-M's T K Rangarajan, Manoj Jha of Rashtriya Janata Dal, Aam Aadmi Party's Sanjay Singh and Rashtriya Lok Dal leader Jayant Chaudhary among others, attended the meeting. 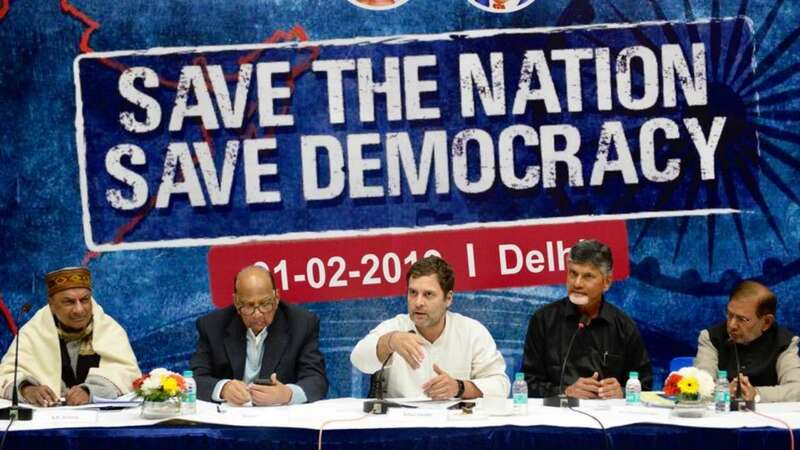 Senior Congress leaders Ahmed Patel, Ghulam Nabi Azad, Mallikarjun Kharge and A K Antony, Danish Ali of JDS and Sharad Yadav were also present in the meeting.Several opposition parties have been claiming that only two-three countries are using EVMs and the rest have reverted to the ballot paper system following complaints of malfunctioning of these machines. The Congress, while supporting the demand, has maintained that since the Lok Sabha election is just around the corner, the EC should ensure counting of paper trail in 50 per cent booths across the country to ensure there is no doubt in the minds of the voters. Chief Election Commissioner Sunil Arora on Friday ruled out going back to the ballot paper, a demand raised by many opposition parties who have questioned authenticity of the electronic voting machine (EVM). "We are not going back to the days of ballot paper. (The) EVMs have been in use in our country for more than two decades. And it has been a consistent policy of the ECI (Election Commission of India) for quite sometime and I think it will remain the same," Arora said. "Political parties have a right to make their feedback known and their apprehensions because they're the biggest stakeholders after the voters. But, we're not going to go back to ballot-paper days. We're not going to the days of ballot papers being snatched, muscle powers being used for that. Inordinate delays in counting," the chief election commissioner (CEC) said. He was interacting with the media after two days of deliberations with political parties and officials here over the upcoming general election. Election Commissioner Ashok Lavasa as well as deputy election commissioners Umesh Sinha, Sandip Saxena, Sudip Jain and Chandrabushan Kumar were also present. The CEC's support of EVM comes on heels of a raging debate over the efficacy of the machine. At the Brigade rally of opposition parties here last month, National Conference chief Farooq Abdullah had called the EVM "chor (thief) machine". Arora cited that there was a difference between tampering and malfunctioning. "We've been using the words very loosely as if they are synonymous. Tampering and malfunctioning are two different things. The commission has zero tolerance on malfunctioning. We're constantly trying to upgrade the EVMs and make them foolproof." On a US-based self-proclaimed hacker's recent claim that the 2014 poll was rigged by tampering EVMs, Arora described the claim as "false" and an "ploy with criminal intent". The CEC said the EVMs were manufactured by "highly-secured" companies, which have been engaged in defence equipments manufacturing too, and a technical expert panel supervises it. Arora said the voter-verifiable paper audit trail (VVPAT), which have been successfully used in the recent state elections, would now be used across the country in the upcoming Lok Sabha polls. He pointed out that the VVPATs were used in three by-elections in West Bengal -- Uluberia, Noapara, and Mahestala -- and there was not a single request for recounting.